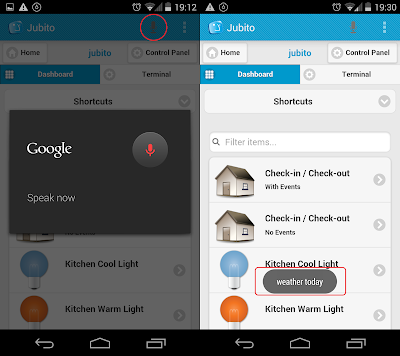 The new coveted feature that incorporated in the new version of jubito app (v1.2) is the speech recognition and speech synthesis. It allows us to hit the speech button and come out with a preferred command. That means that from now on your instruction set names (including launchers and events) must listed speech friendly. Assume that we have three different Instruction Sets that give us the weather conditions. Let's say 'weather today' that consists of a set of today's conditions, 'weather tomorrow' for the day after and 'forecast' for both situations. For the example to take effect you need to check your weather settings. 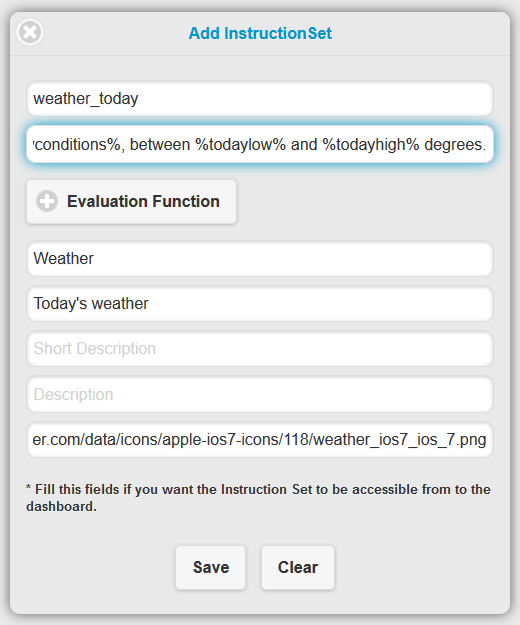 Today %todayday% in Athens, %todayconditions%, between %todaylow% and %todayhigh% degrees. Tomorrow %tomorrowday% in Athens, %tomorrowconditions%, between %tomorrowlow% and %tomorrowhigh% degrees. Today %todayday% in Athens, %todayconditions%, between %todaylow% and %todayhigh% degrees. Tomorrow %tomorrowday% in Athens, %tomorrowconditions%, between %tomorrowlow% and %tomorrowhigh% degrees. Optionally fill description and any other field you want in order to be accessed from the dashboard. The % enclosures represents the built-in functions that are responsible to translate the retrieved weather data to values. 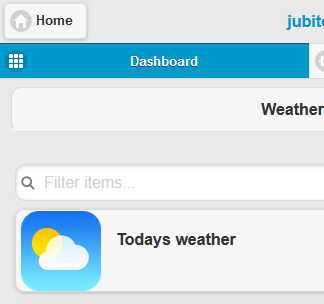 Find more weather functions. Now open the app and press speech button. The approach is very simple, we just speak the instruction set id (name) and its posted to the server. Once it acknowledged we'll be able to hear the response (from speech synthesis) or see any kind of action that use this example, for instance turn on an appliance. The only limitation we should conform is that we need to replace blank spaces with underscores. Update: Latest versions of Jubito, automatically replace blanks with underscores. Alternatively before create an instruction set you can perform a preferable command and see how it prints out. hye, i already do the configuration web, but i dont know how to open it using android apps, what should i insert for host and port? is it ip address and port:8080? Host should be your IP address or your dyndns, depend on your settings. By default is localhost as well port number 8080.